Performing repetitive computer tasks can have negative health effects like stress injuries and even carpal tunnel. 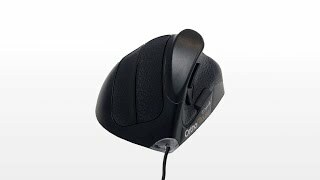 Upgrade to a newer standard of computer mousing with the OrthoMouse Wireless Ergonomic Mouse by OrthoVia and feel what better ergonomics can do for your work style. Its unique contoured shape was designed to minimize pressure on arm and hand muscles, and can be used whether you're trying to prevent injuries or curtail them. Don't let a jar of pickles, olives, or your grandmother's jam cause pain or injury. Trying to open a stubborn jar requires high hand forces which lead to unnecessary strain. A jar opener decreases the grip strength necessary to open the often-stuck jar. Keep your hands safe with an UPLIFT jar opener, free with your purchase. I use it on my Mac-works very well except on Mac the arrow icon does not function since it's a Mac. $124.00 List Price: $139.00* The list price is the same as the MSRP (Manufacturer's Suggested Retail Price). It may not necessarily be the price at which the product is sold.